I would like to sell my car, a toyota lucida estima luxury edition, a petrol and automatic car with 235* kms which has been my partner all over new zealand. The wof is valid until the 16/01/2016 and the regu is valid until 27/01/2016. I bought the car from a backpacker couple who bought it from a kiwi-family. I changed 2 tyres, the 2 front shock absorbers and a piece of the radiator. I also changed the oil with the filter and some lights. I have all the papers to prove it. I kept all engine liquids topped up at all times. The engine coolant is actual coolant and not just water. The van is fully arranged with a bed and a kitchen. You can drive legally with 4 people inside as there is still 2 seats at the back and 2 people can sleep easily in the bed. You can convert from the living room to the living room quite easily. I did it with my sister and my parents and even if it needs organisation it works! My dad who is 183cm tall had no problem to sleep in the van. We did it two times in May and in November, 2 people sleeping in the van, 2 people in the tent which is included in the price! The tent is a 3000m waterproof for 2 people and weight 2.7kg. Hoops of the tent are a bit damaged but still ok. I have also 2 small tarps to put on the floor for the tent, a picknicking sheet and a kind of blanket that we use as a mattress when we slept in the tent. 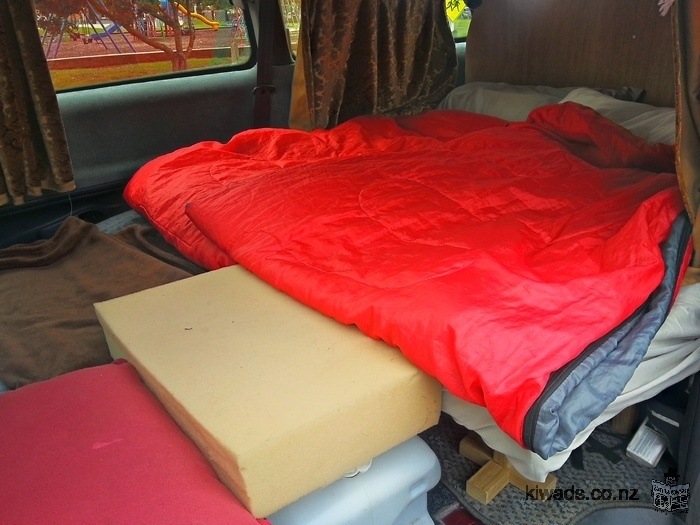 To sleep inside, besides the mattress, 1 sheet, 1 blanket, 2 sleeping bags, 4 pillows and a special sleeping bag to sleep during winter (-5°C) are included! The van has a backwards-camera, two roof-windows, air con and two tinted/mirrored rear windows. a fishing rod and hooks/lure etc. is also included, ready for fishing! if you have any questions or want to have a look/drive just send me a message or call me. I have limited cellphone service, texting or e-mail should be fine though. I prefer to leave the car from the 10th December but it is negotiable.